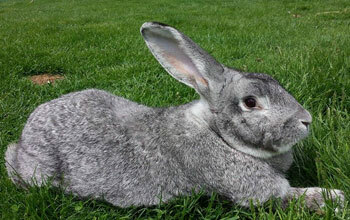 Flemish Giants are one of the oldest & largest breeds of rabbits in existence. 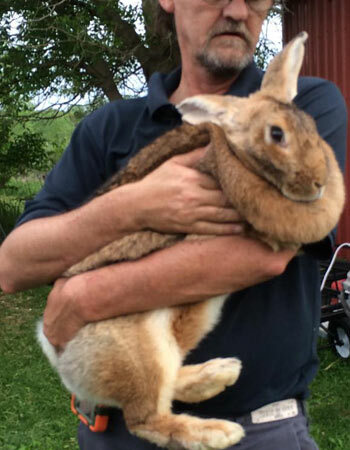 Experts believe that this giant rabbit breed might be descended from related breeds such as the Stone Rabbit and the European Patagonian; both of which are now extinct, but were raised for fur and meat purposes. The first recorded reference to this breed was noted as being from the Flanders region in Belgium, during the 16th Century. They were exported from England into the United States in 1893; later becoming a charter breed of the (then newly formed) American Rabbit Breeders Association (ARBA) in 1924. 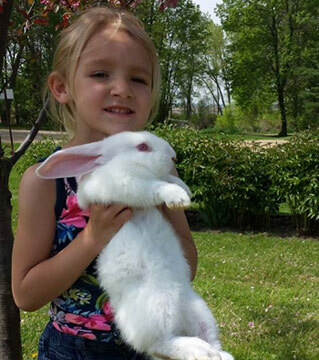 What is a Flemish Giant Rabbit? 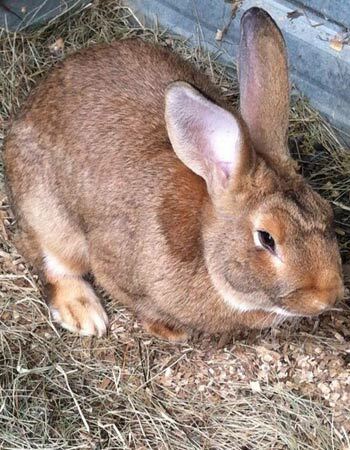 Although there are several differences of desired traits in this giant rabbit breed, the two most commonly used descriptions are that of the ARBA & the British Rabbit Counsel (BRC) Breed Standard’s of Perfection. Both standards state slight differences, from the American minimal weight standards for fully matured bucks at 13 pounds & 14 pound does, to the British standard of 11 pound bucks & 12 pound does. Other differences include body style, with the ARBA calling for a semi-arched mandolin shape & the BRC desiring longer, flat bodies. Otherwise, both state that heavy bone structure, mass, & thick, long ears, with bold eyes & dense, short fur that has a roll-back effect when brushing your hand across their backs in a back-to-front motion. Get your copy now! Also available as EBOOK! In the United States, there are 7 recognized varieties of the breed: Sandy, Fawn, White, Light Gray, Steel Gray, Black, & Blue. All are solid colors, as “broken patterns” are not recognized by the ARBA. However, the color standards are different as defined by the BRC, mentioning only Dark Steel Gray. You should definitely read our colors and varieties page for pictures and descriptions of all known varieties. If you have Flemish giant related questions you can read our FAQ section where we answered most of them as well as included tips & tricks. How to care for a Flemish Giant? 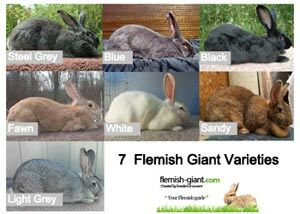 You should keep in mind that caring for a Flemish Giant differs from caring for smaller well-known rabbit breeds, this is of course mainly due to their larger size. Before getting started you will have to consider which of the different housing options would be the best solution. Since there are many housing types to choose from we have made a housing guide that assists you in determining whether you bunny should live inside or outside. Next step is to learn more about the daily care they require. We suggest to read our general care guide! An important part of the daily routine is to provide your giant with a never-ending supply of fresh and clean water as well as a high quality diet of hay and pellets. Not sure what you are allowed to feed them? 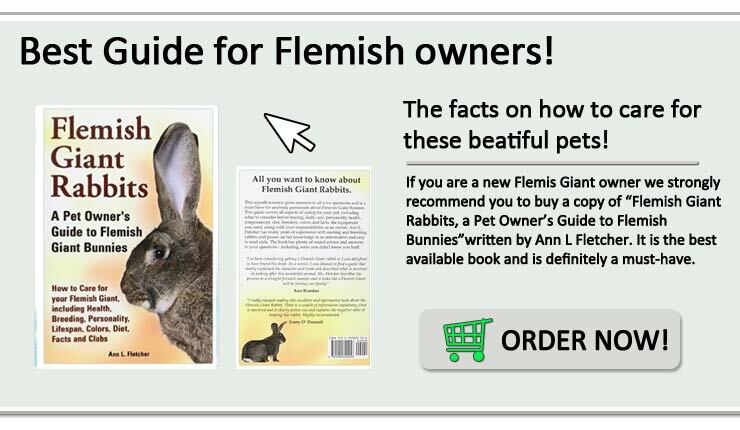 Have a look at our what to feed a Flemish Giant page that contains a lot of useful information. If you still haven’t found the answer you were looking for you could also make a comment or reach out to us simply by filling in the contact form. Flemish are thought to have originally been used for fur & meat production. However, it has since been realized that due to their large bone density, the meat to bone ratio is not the most ideal prospect available for such a purpose as meat production. 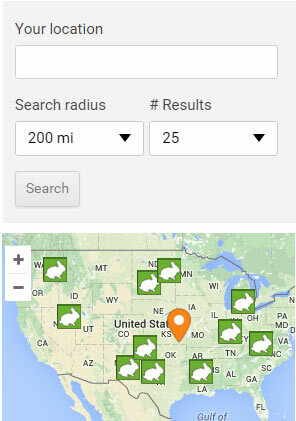 Instead, they are now primarily kept as pets & showmanship animals, as well as for 4H projects in the United States. These gentle-giants are well-known for their easy-going, calm, docile nature. Because of this, they make great pets for children & adults alike. Learn more about their Personality & Temperament!They are quite intelligent and easily trainable as well. It should be stressed though that proper handling of such large bunnies is very important- for your benefit as well as theirs. They do have very powerful hind legs, & when they feel threatened or scared, or are hurt, they can quickly inflict serious injury. Otherwise, due to the size of these bunnies, respectfully compared to that of a medium-sized dog, they require more money & time spent in caring for them than that of a smaller breed of rabbit. However, owning such a wonderful rabbit is well worth the investments to have one, or more. Among other things, when considering becoming a Flemish Giant owner, it’s always best to learn all that you can before you buy. Housing, daily care, grooming, high-quality feed, showing, & neuter/spaying or breeding options & kit-care – if you decide to breed – are vital decisions that will have permanent effects on the life & longevity of these great rabbits; which have an average life expectancy of approximately 6 years, if well cared for.